1lb. Mahi-Mahi filets; 1Tbsp. Chopped Garlic (per fillet); 2Tbsp. Lime Juice (per fillet); 2Tbsp. Olive Oil (per fillet); 1Tsp. Basil (per fillet); Salt/pepper to taste. 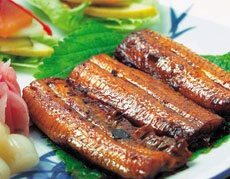 Marinate fish for a few hours or overnight in refrigerator. Grill on high for 5min each side, searing juices into meat.